Now we have one more way for you to add articles to your digest. 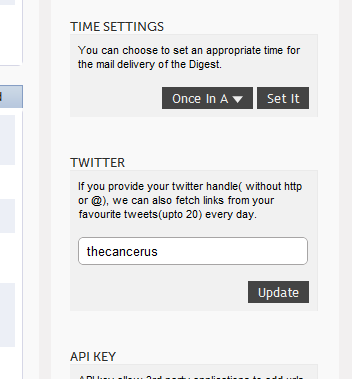 We can now pick your links from your favourite tweets and add it to your digest. You can specify your twitter handle on the right side in your dashboard. When you add your twitter handle for the first time we will only import links from first 20 favourite tweets, and from then on, we will keep adding new links that you add to your favourite list. Only thing you need to remember is that, for now we can only pick links, if your tweets are public. This is just a start, a deep integration with twitter is coming, meanwhile do let us know your feedback so that we can keep improving it.